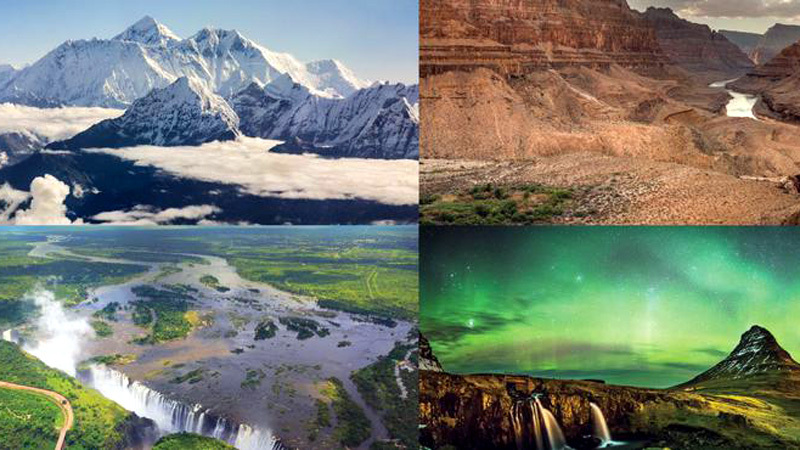 Whether you're catching a spectacular sunset at The Grand Canyon or seeing the Northern Lights dance across the sky, you're sure to never forget your visit to one of the Seven Natural Wonders of the World. It’s easy to understand why millions trek across the globe to explore mother nature’s greatest marvels, as chosen by CNN and the Seven Natural Wonders organization in 1997. Yet these awe-inspiring sites are more than just outer beauty; each one is filled with astounding surprises. So, let’s dive into the Great Barrier Reef, go over Victoria Falls, and explore Mount Everest from top to bottom to uncover what makes these sites stand out as the world’s greatest natural wonders. Unlike other natural wonders, the Aurora Borealis can be seen from many parts of the world, including Alaska, Iceland and Finland. Many travelers visit these polar regions with the hopes of catching nature’s incredible (but very unpredictable) light show. Hint: The winter is prime viewing season, and the higher the latitude, the more likely you are to see them. Earth isn’t the only lucky planet. The Northern Lights occur throughout the solar system, appearing on Jupiter, Neptune, Saturn and Uranus. The Northern Lights can fly south. In times of high solar activity, they have been spotted in places such as Oklahoma and Atlanta. In fact, they even made an appearance in Virginia during the Civil War, lighting the sky at the Battle of Fredericksburg. 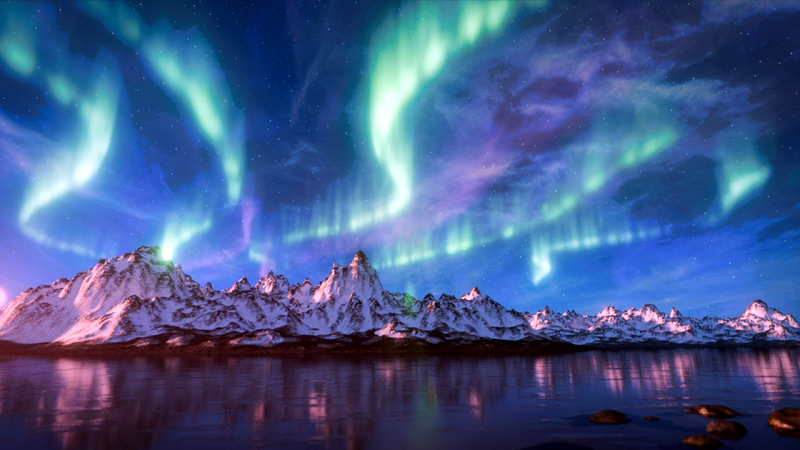 The Northern Lights are caused by electrically charged particles entering the Earth’s atmosphere at high speeds. These particles originate from the sun and travel between 180 and 310 miles per second. Red and green lights are the result of oxygen atoms, while purple lights are caused by nitrogen. 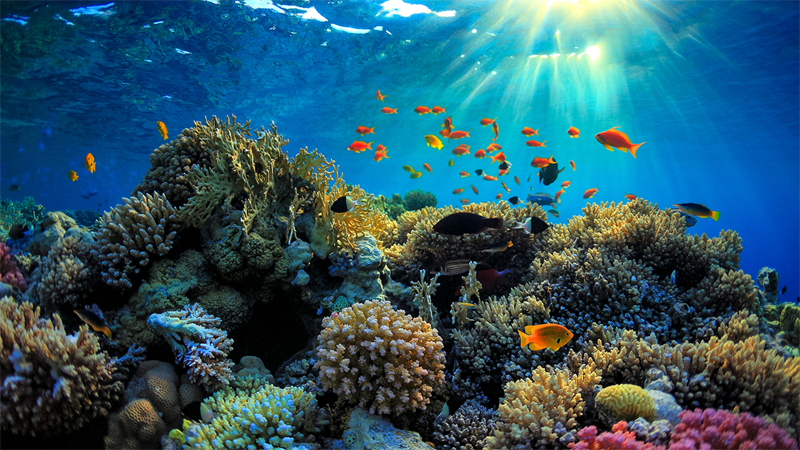 The gem of Australia, the Great Barrier Reef is both breathtakingly beautiful and ecologically important. A delight for snorkelers, scuba divers and sunbathers, the world’s largest coral reef includes over 900 islands, 2,900 separate reefs and a plethora of diverse marine life. Covering over 133,000 square miles, the Great Barrier Reef is larger than the Great Wall of China (and, unlike the wall, it is actually visible from space). An astonishing 10 percent of the world’s total fish species can be found within the Great Barrier Reef. The reef’s most dangerous fish is the box jellyfish, which has 24 eyes and 60 venomous tentacles, with enough poison to kill humans. The Great Barrier reef is the largest living structure on the planet, and each of its 3,000 reefs has its own ecosystem. The reef provides a home for over 400 species of hard coral, 300 species of soft coral, 1,600 species of fish, 134 species of sharks and rays, 30 species of whales and dolphins, and six species of turtle, making it one of the most diverse ecosystems on earth. It is larger than the United Kingdom, Holland and Switzerland combined. Bleaching, caused by warmer water temperatures, is a major threat to the reef. Bleaching was severe in 2002, when aerial surveys showed that over 50 percent of reefs experienced some coral bleaching. In 1911, the "SS Yongala," a 100-meter passenger ship, sank in the lagoon. Today, it is a massive fish sanctuary and widely regarded as one of the world’s greatest diving wrecks. The Dugong, a manatee-like marine mammal, is one of Australia’s threatened species. Still, there are more of them (11,000) in the Great Barrier waters than anywhere on earth. 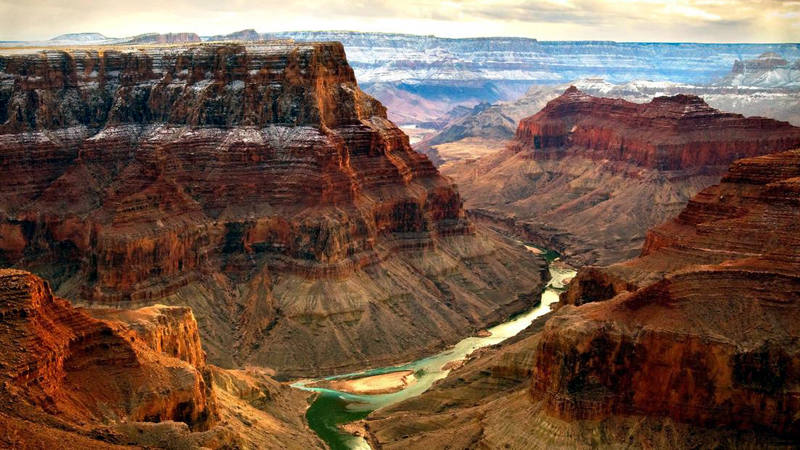 Like apple pie and 4th of July fireworks, the Grand Canyon is an iconic symbol of America. Every year, five million people visit the famed Arizona attraction to take in its magnificent landscape. Carved by the Colorado River, the 6-million-year-old Grand Canyon stretches over 227 miles long and 18 miles wide, leaving plenty of room to hike, helicopter, take a mule ride or simply enjoy the view. But, what exactly makes this canyon so grand? The canyon is the only place you'll find the Pink Rattlesnake, whose unusual color helps it blend in with the rocks. As such, tourist sightings are extremely rare. In 1956, a plane crash over the canyon became the first to result in more than 100 deaths. The tragedy helped prompt the government to form the Federal Aviation Administration (FAA). The North and South Rim are only 10 miles apart...but driving between them takes around five hours. It houses over 1,000 caves, but only one is open to the public. When the Grand Canyon became a national park in 1919, it attracted fewer than 45,000 visitors. Today it is the second most visited park in the United States, welcoming 6.3 million visitors. Only Great Smoky Mountains National Park is more popular. 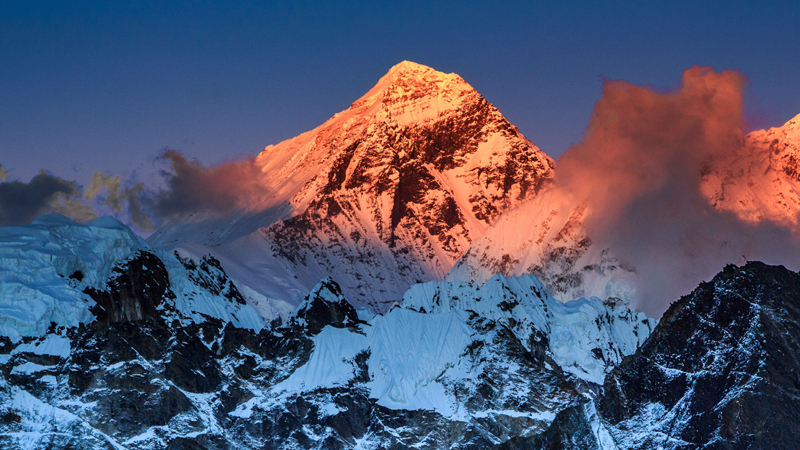 Thrilling, awe-inspiring and unforgiving are words often used to describe incredible Mount Everest. Referred to as “Sagarmatha” in Nepal and “Chomolungma” in Tibet, this legendary site is over 29,000 feet tall — about the size of 20 Empire State Buildings! For decades, the world’s highest point has been a site for triumphs and tragedies, its mysterious aura attracting dreamers, thrill-seekers and everyone in between. In 1952, New Zealand climber Edmund Hillary and Nepalese Sherpa Tenzing Norgay were the first people to reach Everest’s summit of Everest. Previously, Norgay unsuccessfully tried to get to the top six times. Approximately 3,000 people have successfully climbed Mount Everest, but over 297 people have died trying to climb it. Avalanches are the most common cause of death. The oldest man and woman to climb Everest were both Japanese: 80-year-old Yuichiro Miura and 73-year-old Jordan Watanabe. Climbing is costly: adventurers spend around $75,000 to climb to the summit. Sherpas used to regard Everest as sacred, believing gods and demons lived in the high peaks and the Yeti roamed the lower slopes. Mount Everest formed about 60 million years ago, when India crashed into Eurasia. The summit is just below the cruising height of a jet (around 31,000 feet) and winds up there can reach a bruising 175 miles per hour. The warmest average daytime temperature on the summit is about −2 degrees, but temperatures can drop as low as -60. Everest grows about 4mm higher every year due to geologic uplift. While Mount Everest is the highest mountain above sea level, Hawaii's Mauna Kea is the tallest mountain from base to peak. It measures 33,500 feet, but only about 14,000 feet is above sea level. 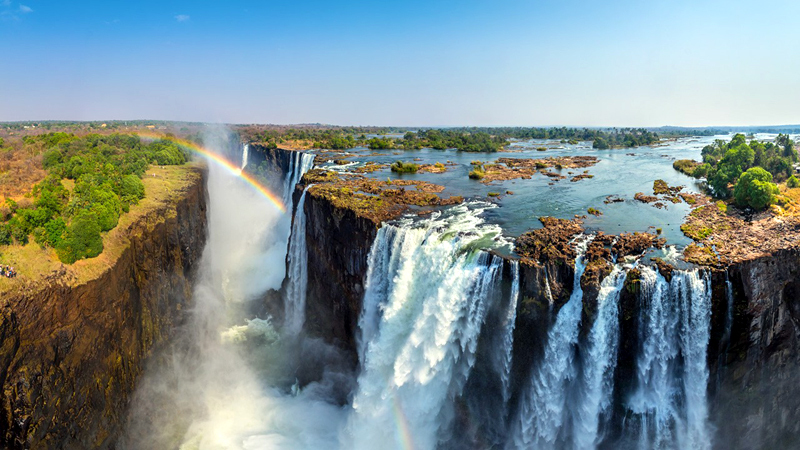 Powered by Zambia’s Zambezi River, Victoria Falls is a massive natural wonder that stretches across over 5,600 feet and reaches heights of 354 feet. Victoria Falls provides a natural border between the countries of Zambia and Zimbabwe, but viewing the falls from the Zimbabwean side provides a fuller view. The Victoria Falls Rain forest, on the Zimbabwe side of the falls, is the only place on earth that experiences 365 days of rain. During full flood season (February-March), as much as 540 million cubic meters flow over the edge of the falls every minute. There are no less than six streams and five gorges at the falls. While many waterfalls create rainbows, Victoria Falls is one of the few places in the world to see a lunar rainbow (or moon bow, as some call it), which is produced by moonlight instead of sunlight. The falls are powerful enough to sweep away elephants, an unfortunate incident that occurred in 2013. 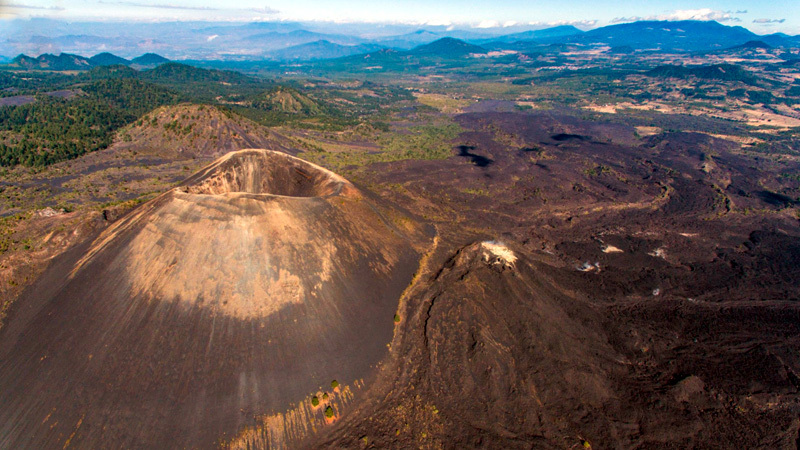 Another North American natural wonder, Parícutin is a volcano located in Michoacán, Mexico, 200 miles west of Mexico City. Though not the largest or most active volcano, Parícutin is special because it was the first volcano that humankind witnessed from beginning to end. In 1943, Parícutin emerged from a cornfield owned by local farmer Dionisio Pulido, growing to nearly 500 feet in just over a week. Scientists, tourists and the media quickly flocked to see this natural wonder, which erupted for 19 years and grew to over 1,300 feet. Though now dormant, the volcano is still a hotbed of fascinating information. Parícutin’s first eruption was on February 20, 1943, around 4 p.m. local time. Weeks prior, residents said they heard a noise like thunder. The lava’s temperature was 1,958 degrees, and it moved at a speed of 196 feet per minute. A later study indicated 21 earthquakes preceded the eruption. Paricutin was the most active in its first year, growing to four-fifths of its final height. Its lava field covered 10 square miles. It’s easy to see why the Harbor of Rio de Janeiro makes the list of the greatest natural wonders. The balloon-shaped bay, formed by erosion from the Atlantic Ocean, is home to majestic mountains and blissful beaches. Iconic sites such as Copacabana Beach, Ipanema Beach, Sugar Loaf Mountain and the Christ the Redeemer statue can all be found here. The wonder is named for a river that doesn't exist. In 1502, Portuguese explorer Goncalo Coelho mistook the mouth of the bay for a river, so he inaccurately named it Rio de Janeiro, which means “River of January." The Harbor of Rio de Janeiro is the deepest natural bay in the world. There are more than 130 islands and over 50 miles of beaches within the harbor. Adding to the beautiful scenery are gorgeous granite mountains, which are part of the Serra do Mar chain that runs 922 miles along the coast of South America. 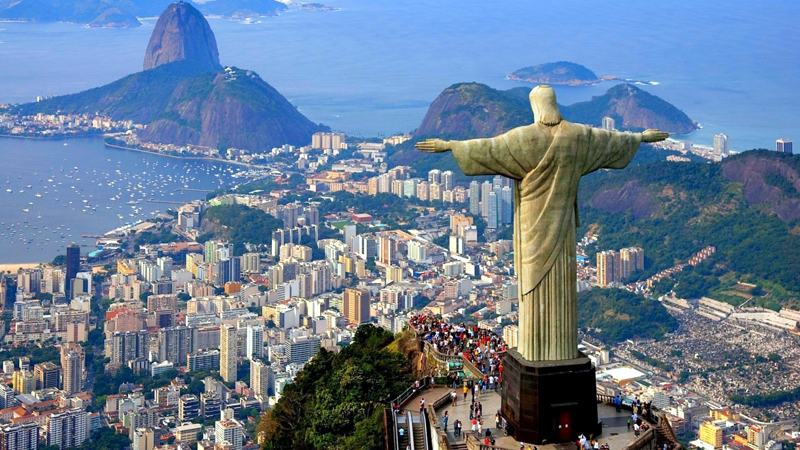 The largest is Corcovado Peak (2,310 feet), home to the Christ the Redeemer statue. The statue is 135 feet high and weighs 635 tons.